SWAMI TYAGISHANANDA, a disciple of Swami Brahmanandaji Maharaj (a direct disciple of Sri Ramakrishna), was the President of Sri Ramakrishna Ashrama, Bangalore from 1938 to 1951. The Swami was well known for his erudite scholarship and sterling spiritual qualities in the Ramakrishna Order. His discourses and extempore talks on the Gita, Upanishads and Brahma Sutras and Bhagavata, without any reference to notes and commentaries are a legend. 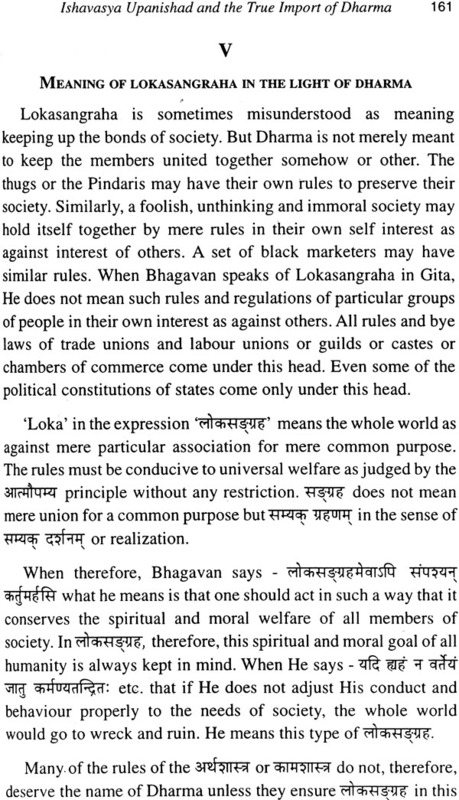 His work, NARADA BHAKTISUTRAS which is a master piece and the illuminating article MESSAGE OF BHAGAVATA in the Cultural Heritage of India (Published from Ramakrishna Mission Institute of Culture, Gol Park, Kolkata), are some of his published writings which reflect his vast scholarship and deep spiritual insight. 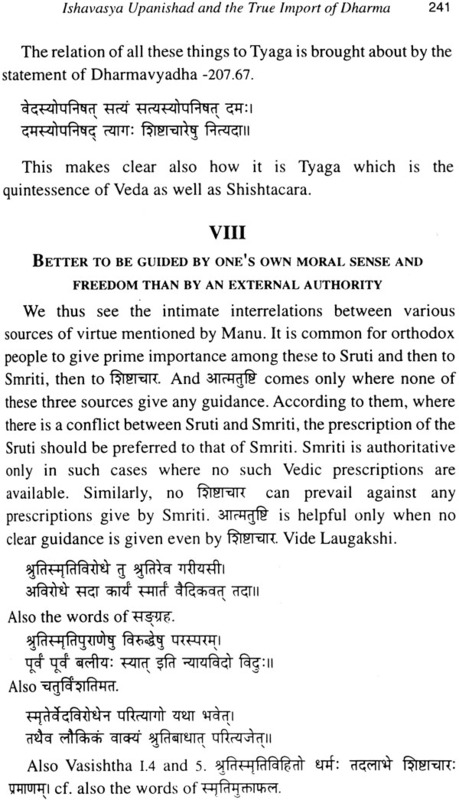 Besides these two works, Svetasvatara Upanishad, Chhandogya Upanishad and Mandukya Karika have appeared as series of articles in Vedanta Kesari (a monthly journal published from Sri Ramakrishna Math, Chennai). 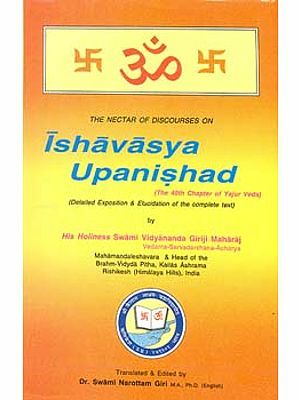 The material presented here are the class-notes of scriptural classes on ISHAVASYA UPANISHAD by late Swami Tyagishanandaji Maharaj, an erudite scholarly. monk of the Ramakrishna Order at Sri Ramakrishna Ashrama, Bangalore during the period 1946-49. 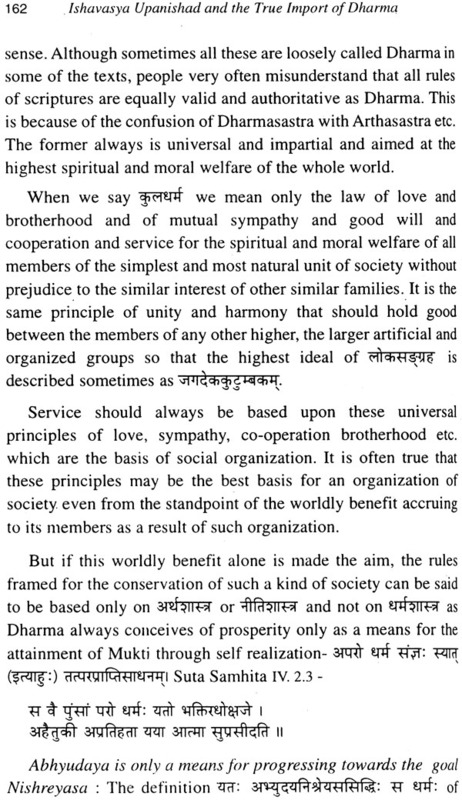 The notes was taken by late Swami Kirtidanandaji Maharaj who had just then joined the Order as a novice (Srikantaiah) and had the privilege of being guided in his novitiate days by Rev. Swami Tyagishanandaji Maharaj. 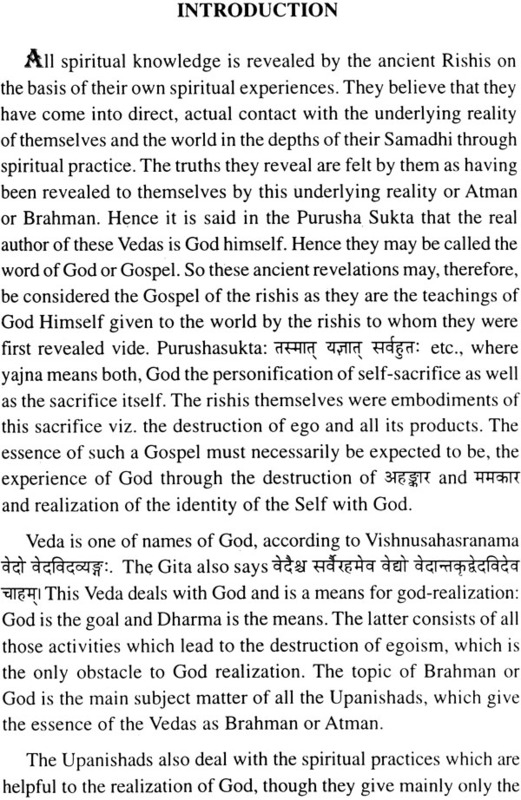 According to the learned Swamiji, the Upanishad has for its core, Dharma in all its dimensions and contains a code of life, a philosophy of social and ethical relations and above all spiritual solutions to human problems. We owe the notes presented here mainly to late Swami Kirtidanandaji, who meticulously recorded them as dictated by Rev. Swami Tyagishanandaji and preserved them for his personal reference. A special feature of the book is that the learned Swamiji quotes copiously from various Srutis, Smritis and Puranas as also from different orthodox commentators to explore the real meaning of the Mantras of the Ishopanishad. 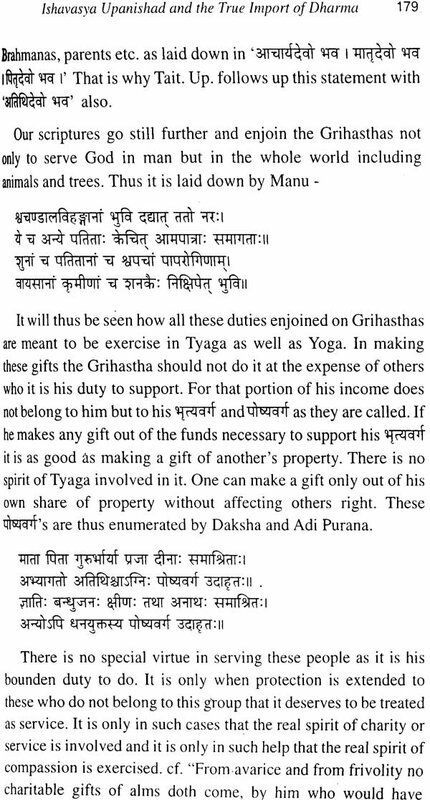 We have presented only the Sanskrit originals of these quoted portions. Though the translations of these texts are not given, we believe readers can make out their meaning in the corresponding context. Apppendix-l gives additional details regarding the theme corresponding to the number indexed for the passage in main text. 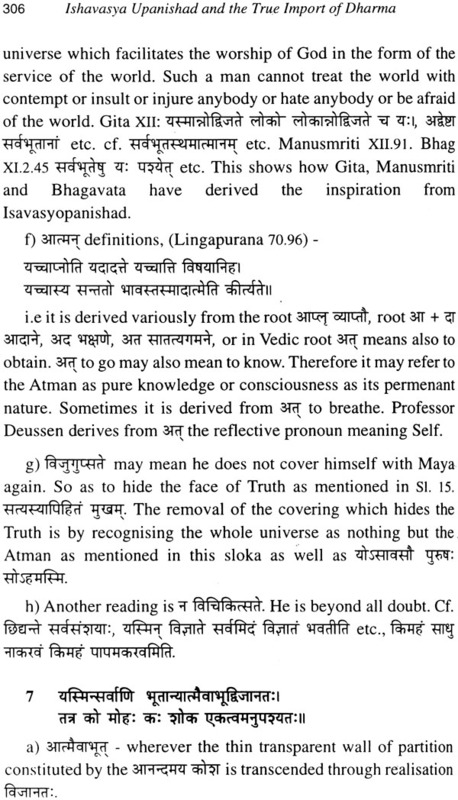 The complete text of the Ishavasya Upanishad and translation of the Mantras are given in the Appendix-2 for reference. A brief profile of Rev. Swami Tyagishanandaji Maharaj is also given at the end of the book. As the learned Swamiji explains in the course of his exposition, 'An attempt at the detailed interpretation of the mantras in the light of the life and teachings of Swami Vivekananda and Sri Ramakrishna has been made here. We are deeply indebted to Mahamahopadhyaya Dr. N.' Ranganatha Sharma, an exemplary nonagenarian scholar and a living authority on Vedanta for expressing some noble sentiments regarding this publication, despite his ill-health. We are also extremely grateful to Vidwan H.V. Nagaraja Rao, an erudite scholar for kindly contributing the foreword which, we have no doubt, has added to the value of the book. 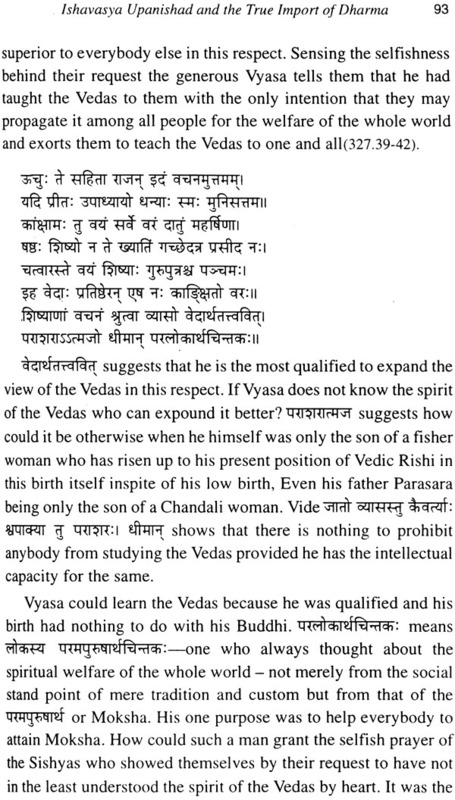 A highly qualified Sanskrit scholar, Dr. K.L. 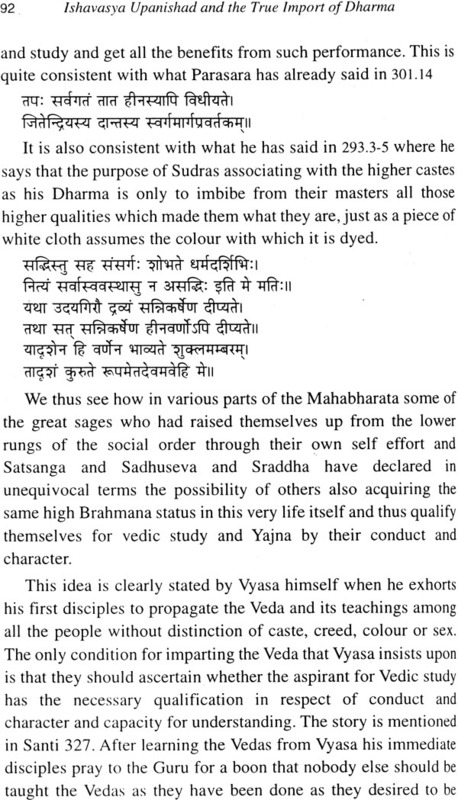 Prasannakshi, has taken immense trouble to go through the Sanskrit portion of the book. We are beholden to her for her. dedicated service. Finally, we acknowledge with deep gratitude the generous contribution of the admirers of the great Swami, particularly Sri M.S Nanjundaiah, whose munificent contribution has been responsible for low pricing this publication. We hope the present book will be interesting to all, especially to the seekers who intend to understand the true import of the Upanishad and help them strengthen their faith in their spiritual endeavour.